Dwyer Stakes: Texas Red Ready To Fire On Independence Day– It looks like another fantastic weekend of racing in New York as they kick off the 2nd annual Stars & Stripes Festival this Saturday, July 4, 2015, at Belmont Park in Elmont, New York. The 126th running of the Grade III Dwyer Stakes joins the Grade I $1.25 million Belmont Derby, the $1 million Belmont Oaks for fillies, both at 1 ¼ miles, the Grade III $400,000 Belmont Sprint Championship, and the $150,000 Victory Ride for three-year-old fillies going 6¼ furlongs. The Dwyer Stakes is for three-year-olds running a one-turn mile with an increased purse of $500,000. Since its inauguration in 1887 as the Brooklyn Derby, the race has been competed at various distances and at various tracks in the New York area. 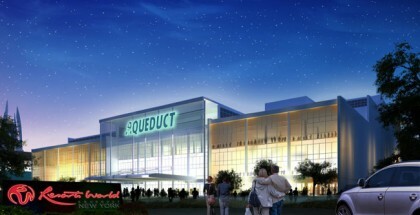 Originally, it was held at the now defunct Gravesend Race Track on Coney Island. It was renamed in 1918 for Mike and Phil Dwyer, brothers who were the “kings” of thoroughbred racing in the late 19th Century. Many years back, this was a Grade I race that was a major part of the American Thoroughbred racing season. It was later downgraded to a Grade II and most recently in 2014 to a Grade III. It was also known as the Dwyer Handicap from 1957 to 1978. The 2014 edition of this race was won by the Linda Rice-trained Kid Cruz who reeled in entry-mate and pacesetter Captain Serious in deep stretch to win the then $196,000 Dwyer in the final strides on July 5, 2014, in the final time of 1:41.12 at the former distance of 1-1/16 miles. The 2015 Dwyer is the seventh race of the day, sandwiched between Race 6, the Grade III Victory Ride, and Race 8, the Grade I Belmont Derby Invitational. It looks like a fun and fantastic day of racing with the Dwyer Stakes having a start time of 3:52 p.m., EST. It looks like we have a small field of seven entered here, and the odds won’t be the greatest on a few of these. I’ll be using three in a multi-race ticket, so let’s take a look. The class of the field is Texas Red, who looks fit and ready for his comeback off the shelf. He’ll definitely need the race as he’s being pointed towards Saratoga this summer. The son of Afleet Alex was off for five months dealing with a foot abscess and has been training very well in Southern California. Last time out, he was second to Lord Nelson in the Grade II San Vicente at seven furlongs on February 1. Trainer Keith Desormeaux recently had him work four furlongs in the heat of the day when it was 90 degrees to get him used to it as New York will be a lot warmer than what he’s used to in California. He also posted a nice mile-long work prior to that short work. His knocks are that he’s shipping in, coming off the layoff and injury, and one mile isn’t his preferred distance. It will be tough to win a graded stakes race off five months rest, but he drew nicely with post #4 inside of speedy Speightster and Hollywood Angel. He looks red hot and ready to fire this weekend. 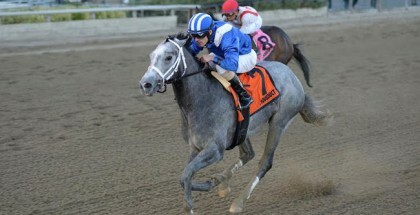 Can he do it off the layoff, travel, and a new track outside of California? Blofeld looks super snappy with a win at this distance, beating El Kabeir back in November of last year in the Grade II Nashua Stakes. He’s coming in off a layoff here and looks tough. I’ve just not been a fan of this horse, so he’ll have to beat me in this race. I’m siding with the other Todd Pletcher entry, Tommy Macho. He won a bang-up allowance race on Belmont Day, traveling 1-1/16 miles and winning by 3¼ lengths in the time of 1:40.4. After watching that race, he went right into my “he’s going to be tough next time out” notes. He’s got a nice pedigree with Macho Uno as his sire and being out of an Awesome Again mare, Starstream. This’ll be his third start off a three-month layoff, and he will need to step it up to compete at this class level. He looks to be steadily improving, and I like the cutback in distance. 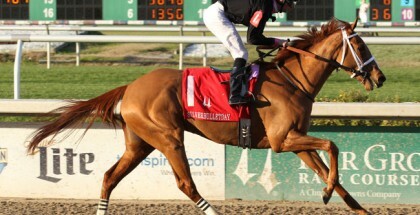 He garnered the #3 hole just inside of Texas Red, and with Castellano in the irons, watch out. He seems to have the number three on his side here: post #3, three-month layoff, 3rd race in his form cycle, and maybe his 3rd win in a row? Hmmmmm, I love numbers. The lightly-raced, undefeated Speightster looks fast and will be stretching out for the first time. In addition, his sire Speightstown has been quite busy lately with winning progeny all over the country. He’s also moving up in class, so this looks like the perfect spot to give him a try. He’s got a nice trainer/jockey combo with Bill Mott and Jose Lezcano and looks ready to take the field wire-to-wire from post #6. I have to go with Texas Red as my top pick to win this race. 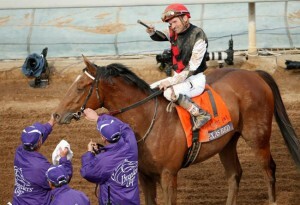 I was gutted when he was off the Triple Crown trail and have been waiting patiently for his comeback. His odds most likely won’t be playable for me for a win bet, so I’ll be playing a Pick 3 with races 6, 7, and 8. I’ll post my play Saturday before the race as I’m still waiting for the odds to move forward. I’ll either pass this race & just watch it or us the #3,#4 & #6 in a leg of a pick 3. The Stars & Stripes Festival looks like a fun way to celebrate Independence Day this weekend. You can’t go wrong with an all-American horse like Texas Red on the Red, White, and Blue day of celebration. Best of luck to everyone, and have a safe, fun-filled holiday weekend. Will Lasix Help Main Sequence in United Nations?